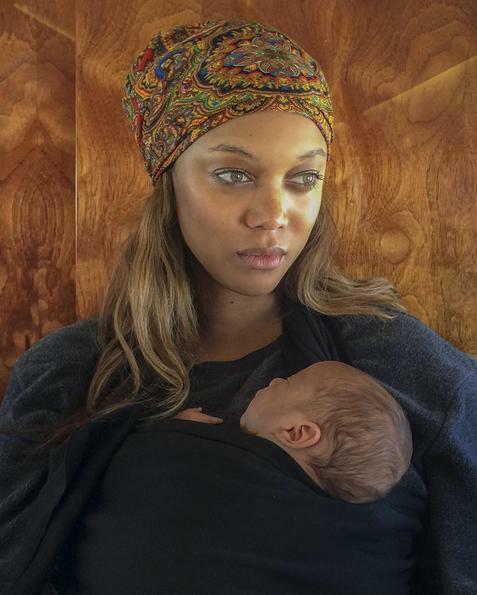 Calling it “the happiest Valentine’s Day of [her] life,” Tyra Banks shared a photo of her son York on Instagram Sunday. Last month, Banks revealed that she and her boyfriend Erik Asla had had a son via surrogate. “He’s got my fingers and big eyes and his daddy Erik’s mouth and chin,” Banks, 42, said, sharing a photo of a baby’s hat. Last year on FABLife, Banks spoke of her emotional journey to become a mother, saying she’d been taking IVF treatments to help her conceive. At the time, co-host Chrissy Teigen also spoke about her fertility struggles with. Shortly after, Teigen and her husband John Legend revealed that she was pregnant. Throughout the years, Banks has said that her career is too demanding to have a child and that she wasn’t ready to slow down yet. However, to become a mother is something Banks has always wanted. “I won’t be happy if I’m not a mother,” Banks told Harper’s Bazaar Singapore in 2012.